Family tradition may be, but may also not be the way forward. Children do not belong to their parents. At some point in life (better sooner rather than later) we must learn how to make our own choices and follow God’s heart, even if it means going against the heart of our parents, friends or against the general solutions accepted as reasonable by the society. People who follow the crowd are bound to get lost in the crowd. If you put your trust in the system you will be bound by its limitations (economy, education, skin colour, cultural situations). Too many people rise only to become another “ex”. Too many remain unaware that success can only be as lasting as its source. Education can get out-dated, trends may and will change. There will always be someone smarter, more beautiful and more “something” than you. Knowing who you are is essential. Knowing who you aren’t is part of that knowing. By getting to know the Mind of the One who made yours (mind), you are getting to know yourself. “In the beginning was the Word” so start there. Ask for wisdom and for an outline of your destiny, and then pray for strength to stay on your path. That path is the only place where you can be safe and fulfilled. Take care of your beautiful mind. Keep it beautiful through a good spiritual education. Remember that thoughts of today will create your tomorrow. Heed that red light in The Book and within your heart, which is there for protection. Have courage to go “against” the crowd and circumstances where necessary. Dare to dream big – understand that possibilities are unlimited and you can decide your destiny. Be fearless when you know you are on the right path; and go after eternal success, which begins on Earth, in the heart of a man or a woman. 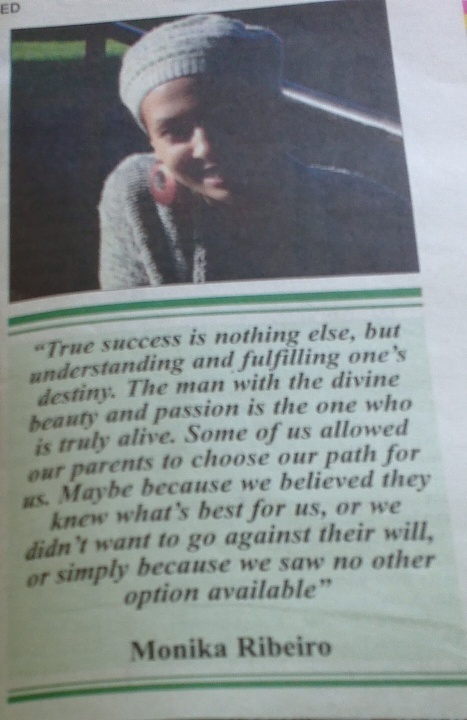 Monika Ribeiro’s “Follow your path…” was previously published by “TheAfroNews” newspaper. Previous Post Are you married and happy? How are you doing? Please consider: a deity forms the fabric of the ontology we are rejecting. I’m great. Thank you, and how are you?